If you enjoy Tetris, match-3 games and Boggle, then Puzzlejuice [99¢] from Colaboratory might be right up your alley. That’s because this falling-block, color-matching, word-finding mash-up combines these things into a nice-looking bundle of pleasure. 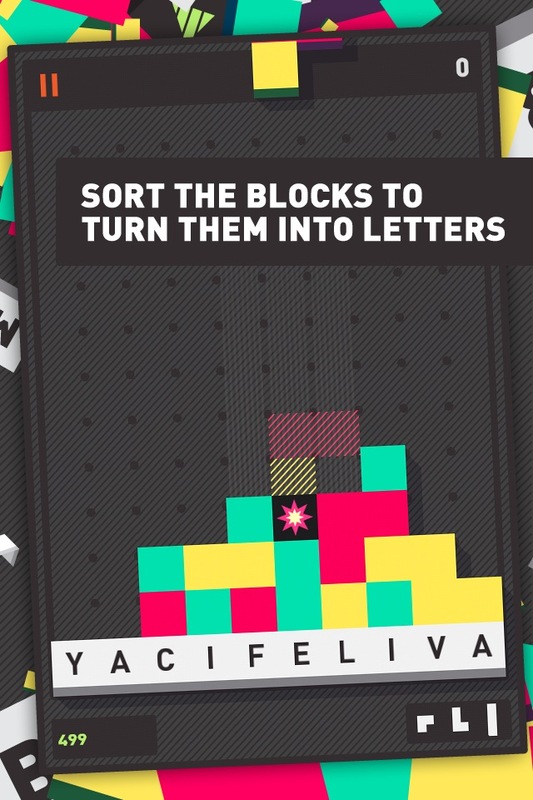 Puzzlejuice starts with falling puzzle-blocks, just like Tetris. You can rotate each falling block by tapping the screen or drag it left or right. A ghost image of the block shows where it will end up at the bottom. When you’re happy with the position of the block, you can swipe it downwards to speed up its descent. And the idea is to form a solid row. That should all sound fairly familiar for anyone who knows Tetris, but that’s just the start of this game. When you form a solid row of blocks across the playing area, instead of disappearing, the blocks turn into letters. And to make the letters disappear, you must draw a line across adjoining letter-blocks, to spell a word in eight directions, like Boggle. If your word is long enough, the surrounding blocks are also destroyed. So now you’re multitasking between managing falling blocks and finding words. The falling blocks are comprised of different colors. Whenever you match-up three or more blocks of the same color, those blocks can be tapped so they convert into letters. So now you’re managing falling blocks, matching and tapping colors and also finding words, which is enough to keep your brain challenged and fully entertained (especially if you’re a male, because apparently we’re not great at multitasking). A series of objectives are provided as well, which can be completed across multiple games. For example, you might need to spell a six letter word, use two power-ups simultaneously or activate 3+ rows at once. By satisfying these objectives, you can unlock power-ups, like “The Kabomb!" (explodes blocks), “Driller" (falling blocks carve through everything they touch) or “Twister" (scrambles the blocks). You can choose up to three power-ups to carry. There are two game modes, Zen and Core. In Zen Mode the blocks don’t drop, but you only get 90 seconds to play. In Core Mode you play until the blocks reach the top of the screen. Core Mode has two difficulty levels, with the harder levels requiring longer words to explode surrounding blocks, but offering three times the points. Basically, the longer your words, the bigger the width of your explosion, which all helps your Game Center score. I tried this universal game on the iPad and iPod touch, both of which played well, although the music spluttered at times on my 4th generation iPod. There’s a “picture-in-picture" mode for the smaller screen devices, which shows a zoomed in image of what’s under your finger. On the iPad that mode is unnecessary, but on the smaller screen it’s useful for seeing the words you’re swiping, or un-swiping. 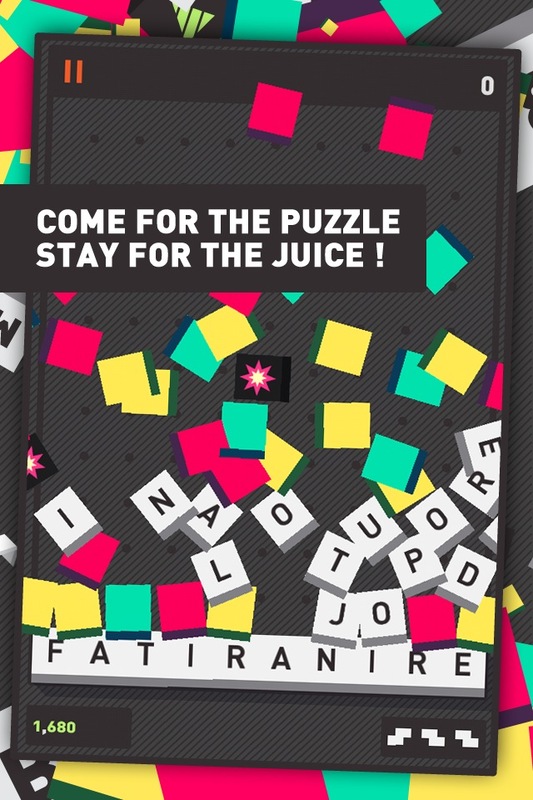 Puzzlejuice may not be totally original, as it combines three common App Store genres, but putting them together into one game was a stroke of genius. It’s a real breath of fresh air with loads of frantic gameplay, style and humor. As an added bonus, Puzzlejuice is currently on sale for 99¢ due to being featured by Apple, and at that bargain price (or its original price of $2.99, for that matter) it’s a strong recommendation for puzzle and word game fans.